What became of HMNZS MONOWAI - AO6? WHAT BECAME OF HMNZS MONOWAI A06? 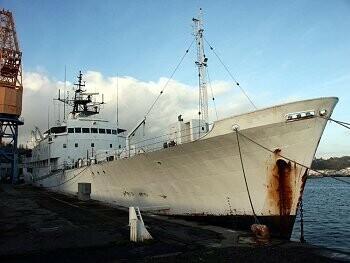 MONOWAI decommissioned on 21 April 1998, was taken to UK at the end of 98 and ended up in Lowestoft. The company who bought her indicated that they were planning to convert her to a small luxury cruise ship but the cost of the project proved to be prohibitive and she was thus offered for sale. During this time there was a small fire onbaord but nothing too serious. In October 2002 she was towed away to Cadiz for scrap. She broke free in the English Channel but the French Navy captured her, towed her to Brest whence she was taken to Cadiz. (Approximate translation) Perilous towing of Monowai the ex New Zealand oceanographical ship (disarmed). Monowai was towed by a Togolese ship, Le Polar, when it was in difficulty 35 km off the Finistére Coast, in the night of 26 to October 27. The tow being broken and the weather conditions not making it possible to board, a Super-Frelon of the 32F (squadron?) landed an evaluation operating team on board. L'Alcyon tries a to take the ship in tow which is unsuccessful due to swells from 8 to 10 meters. The L'Abeille Flandre installs and then succeeds in taking the vessel in tow. A new parting of the cable obliges a new launch of Super-Frelon for assistance. The ship is taken in tow again and the convoy can return to Brest the following day. Led in the naval base and moored with old row of the aircraft carriers, the Kampuchean cargo liner Winner seized by the national Navy for traffic of cocaine, the New Zealand vessel has waited since then to be towed to the Spanish demolition site in Cadiz, its destination of origin, until Monowai will be reinforced. It is a Portuguese salvage tug, the Falmouth Bay registered in Madeira, which will be charged to convoy Monowai for its last voyage. For a while it looked as if she might be gutted and the hull turned into a pleasure yacht but I understand nothing came of this and she is probably by now scrapped. Any additional information would be welcome.